Then, just update your package list, and install the apassman package along with the rest of your software. Simple as that. 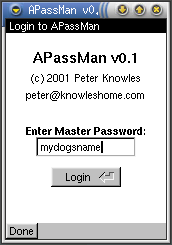 This is the homepage of APassMan, a secure password manager for the Agenda VR3 PDA ( Agenda Computing ). APassMan uses the FLTK and FLPDA libraries, and is released under the GPL license. 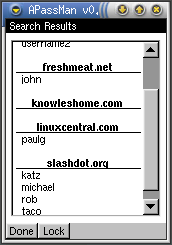 The user interface was based on the screenshots of Strip , a password manager for the palmOne platform. Size of database is limited only by the Agenda's RAM size. Accounts are arranged under servers / categories for fast and convenient access. Includes a password generator for automatic random generation of passwords for accounts ( The password generator includes all the features of APassGen ). Includes a find feature with options to search through any combination of fields ( server names / account names / comments or passwords ). Every window includes a lock button to immediately lock the program ( save the database and quit ). All plaintext information is removed from RAM after the program terminates. Unencrypted information is never saved to disk / flash. File format is fully compatible with gpasman ( A password manager for Gnome ), as well as kpasman ( The KDE equivalent ). This version of APassMan includes a binary compiled for the newest 8.00 Kernel and 1.2.6 romdisk available from Agenda Computing. The older, "non-snow" binary is no longer included. The conversion programs are included in this source package. 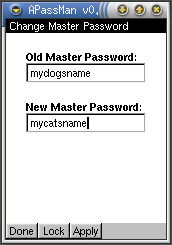 This is the login screen, where the master password is entered to unlock the database. This is the list of servers or categories. Clicking an a server opens up the list of accounts for a particular server. Under the 'Menu' button is an option to change the master password. The 'New' button will create a new server. The 'Find' button will initiate a search. The done button acts as a 'back' or 'cancel' button throughout the program, and the lock button will save and quit the program at any time. This is the window to change the master password, which must be at least 4 characters long. 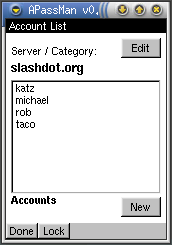 This is the list of accounts in a particular server / category ( in this case, slashdot.org ). Clicking on an account will take you to the account view window which provides the details of the account. The 'Edit' button will edit the server ( allowing you to rename or delete the server ). The 'New' button will create a new account in the current server. This is the account view window. To edit the account, click on the 'Edit' button. To delete the account, click on the 'Delete' button. 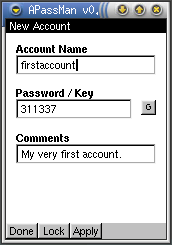 This is the window used to create a new account ( identical to the account edit window ). 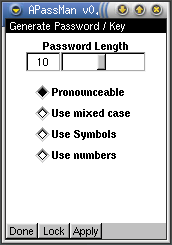 The small 'G' button next to the password field will open the automatic password generator window. The 'Apply' button will save your changes. The 'Done' button will cancel your changes and return you to the previous window. This is the server edit screen. 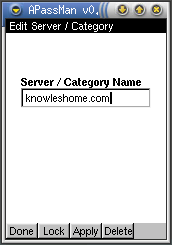 The server name can be modified by typing in a new name and clicking 'Apply'. The server can be deleted by clicking the 'Delete' button. This is the password generator window. 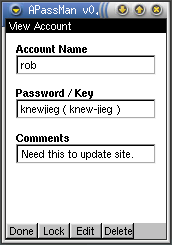 The length and type of the password can be modified and a random password generated by clicking on the 'Apply' button. This is the search results screen. The bold entries are the server names, and the non-bold entries below the servers are the accounts contained in the servers which match your search. Clicking on a server will take you to the server view. Clicking on an account will take you directly to the account view window. APassMan is written by me ( Peter Knowles <peter@knowleshome.com> ). It includes code from APG, written by Adel I. Mirzazhanov as well as code from gpasman, written by Olivier Sessink. Any suggestions, comments or patches are welcome.